A combination of two ordinary materials  graphite and water  could produce energy storage systems that perform on par with lithium ion batteries, but recharge in a matter of seconds and have an almost indefinite lifespan. Dr. Dan Li, of the Monash University Department of Materials Engineering, and his research team have been working with a material called graphene, which could form the basis of the next generation of ultrafast energy storage systems. Once we can properly manipulate this material, your iPhone, for example, could charge in a few seconds, or possibly faster. said Dr. Li. Graphene is the result of breaking down graphite, a cheap, readily available material commonly used in pencils, into layers one atom thick. In this form, it has remarkable properties. Graphene is strong, chemically stable, an excellent conductor of electricity and, importantly, has an extremely high surface area. Dr. Li said these qualities make graphene highly suitable for energy storage applications. Now, Dr. Li and his team have discovered the key to maintaining the remarkable properties of separate graphene sheets: water. Keeping graphene moist  in gel form  provides repulsive forces between the sheets and prevents re-stacking, making it ready for real-world application. The technique is very simple and can easily be scaled up. When we discovered it, we thought it was unbelievable. Were taking two basic, inexpensive materials  water and graphite  and making this new nanomaterial with amazing properties, said Dr. Li. When used in energy devices, graphene gel significantly outperforms current carbon-based technology, both in terms of the amount of charge stored and how fast the charges can be delivered. Dr. Li said the benefits of developing this new nanotechnology extend beyond consumer electronics. High-speed, reliable and cost-effective energy storage systems are critical for the future viability of electricity from renewable resources. These systems are also the key to large-scale adoption of electrical vehicles. Is it just me or are the breakthrus involving graphene becoming a little silly? I mean, it's as if someone reinvented the wheel - literally. @Norezar: I know what you mean, it seems like it's better at every job we have than all of the materials we currently use. Are we staring at the beginning of a Carbon Age? Hope it delivers all that it promises quickly. How about the time the charge can be stored? But generally I agree: graphene seems to do everything except clean the coffepot (but I'm sure someone is working on that, too). I guess the excitement is akin to when integrated circuits got started or nuclear fission was discovered. Fresh water under attack again. Would be impressed if they could use Sea Water or Sewage. 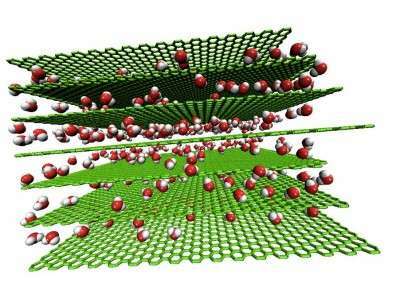 Wait, what's this... graphene water desalinization? @holoman, given energy all water can be made fresh. I really hope this is true. Battery technology has been trapped within this Li roadblock denying any future abilities for portable electric powered systems. With so many people doing electrical battery research I knew that a novel way will appear. Of course there will be plenty more new discoveries from now on. I compare electrical cars of today to the first mobile phones : big and not very practical. Look how well mobile phones turn to be. Future electrical cars will put to shame petrol cars. So..... what amount will the oil gnomes be paying these scientists to let this not pull through ? Ever wonder what happened to all the other breakthroughs that i never heard of again ? its not about us, it's all about their stinky empire and how much more they can make it stink. From what I have heard, battery technology is locked up in an oil-company owned patent. If that is true, the patent cannot expire soon enough - IMHO. Hopefully, graphene will not suffer a similar fate. Ok, everyone, just ignore any battery breakthrough you see on this site. I have seen about 2 dozen articles on battery breakthroughs, over the past 7 or so years. None of these technologies will ever be adopted. EVER! I guarantee any worthwhile battery technology will ever be allowed, almost certainly due to the status quo of those in power. So just ignore any battery breakthrough, you will not get this technology, ever. I have seen plenty of improvements on energy storage in the past decade, you just have to know where to look. Also, just because you read about a breakthrough does not mean it is ready to be marketed on a consumer level (i.e. they just did the research now its up to other scientists and engineers to figure out a way this can be integrated with current technology). Ever wonder what happened to all the other breakthroughs that i never heard of again ? its not about us, it's all about their stinky empire and how much more they can make it stink. Energy companies are not dumb, they know just as well as we do that their source of income is absolutely finite. They want to be at the lead of "the next big thing" in energy. Just not until they've milked their cash-cow dry of course. I don't buy into the "evil oil-companies are going to keep all energy technologies from becoming viable" crap. Sure they will resist some, but from a business prospective if you don't adapt you die (they've been milking the oil business for a long time now). People want change, they have to respond to that or other companies will create a niche and claim the market (which some have). If anything oil-companies should buy into "green" technologies (some of them are actually) in order to 1)expand their interests and 2)protect their own image by investing into the green industry. By all means I'm not a pro-oil company guy, nor am I defending them, I just think they are getting more credit than what is due. Fresh water is a completely renewable resource and is extremely cheap. A slight improvement in irrigation methods would save thousands of times more fresh water than the tiny amount used in these devices. In fact, I bet dollars to donuts that you could easily get enough fresh water for one of these devices by mopping up the condensation off of your iced tea. "Energy companies are not dumb, they know just as well as we do that their source of income is absolutely finite. Just not until they've milked their cash-cow dry of course." i'd really like to be positive but i've read about so many breakthroughs and never see any pull through, i know it takes time of course, and a lot of time has gone by without anything significant breakthroughs, hence my reasoning and conclusion above. please ignore my spelling mistakes, too late to edit. @Corban: Since we are carbon-based lifeforms, we've been in the Carbon Age for quite a long time. As for the entrenched industries vs. innovation debate: have you ever talked to these guys? They still think the environmental movement is a liberal, Commie plot to stop them from doing whatever they want to do to make more bucks than the next guy, at whatever cost to humanity... Oh wait, I guess they're right! So what happens in the winter when the water freezes in these batteries. Do they become unusable? The fallacy of your statement, other than your noble and concerned intent; is that when you remove the need for all the other things in current storage cycle systems that contain hydrogen and oxygen, the amount of 'fresh water' in the battery is likely vastly exceeded when talking about all systems across the board. Further, using a salt component in the water would reduce efficiency by a substantial degree due to heat. Except that NOW the word is absolutely OUT THERE;barring a full on nuclear conflagration and this tech is so simple that mechanically inclined people WILL be making storage devices on their own.Obviously, those people won't be able to make nearly as good a system as industry can, but I'd be willing to bet a trillion dollars(approx amount of $ spent by US on battery development per yr)that someone will be investigating processes and components specifically to make a battery from this discovery.I'm confident to that degree, because I'm already thinking about it. Great question, as well as on the other end, heat. We will need a good insulation component that resists both and that doesn't leak power. I think we'll be looking at a layered housing of different elements as well as a magnetic component. Unlike our current batteries, the housings for this type will be more toxic than the material inside. Monash University just became a very big place. Awesome work, Dr Li and team. rather than just freezing what about evaporation of the water. If this occurs then the graphene sheets will just end up bonding to form graphite. This research gets defunded Aug. 2 2011. Yes it will, and very likely no matter what happens with the debt ceiling and cuts they are arguing about now; but I imagine that the university knows how big this discovery is, and will protect their development at any cost until they can secure their initial process and design patent applications, some of which they have already, or this would never have been put out for public consumption. Some of you are forgetting that batteries are storage devices. They are not energy generators. They tend to make energy already produced more portable and convenient. That being said, things that make energy more "usable" is what energy companies want. What good is electricity to National Grid if you don't have TVs, lightbulbs, et. al.? Batteries for your EV most likely will be fed from a major electric company. What will Exxon and the rest do if everybody bought EVs? Why, get into the electrical generating biz of course. research? One more... If the taxpayer funds the research, why isn't there a "cut of the action" given back to the taxpayers? but I imagine that the university knows how big this discovery is, and will protect their development at any cost until they can secure their initial process and design patent applications, some of which they have already, or this would never have been put out for public consumption. Not really. universities do their research with grant money or the money allotted to them by the government. Oftentimes the money comes from companies who wish to have some research done cheaply (graduates and PhD students cost next to nothing compared to a full time researcher at a company). As such any research results are not property of the university anyhow. As we write this - the Chinese have hacked the research and found at least 10 different ways to build these batteries - all cheaper than can be done in the West. The really sad part of energy research - our top research agencies like DARPA are busy investing $B in dead end, human food competitive tech like biofuel/algae oil research dependent on peak petro and peak phosphate fertilizers (all at scale biofuels are dependent) - clueless to their mass balance negativity and lack of sustainability. That problem can be detoured quite simply. MIT, amongst others, have successfully grown MWCNTs on graphene surfaces. MWCNTs have a far greater surface than the graphene sheets themselves. It should be possible to design a graphene sandwich comprised of x graphene sheets with MWCNTs between the sheets. Such a sandwich could accomodate a lot of stacked sheets before reaching a thickness of, say 4 or 5 micro meters. A capacitor with such an architecture could have both electrodes of the same material; a mind bogging capacity and no freezing problem. The electrons could move 3-D and not only within the sheets (2-D). The article doesn't describe how such a battery would work. I doubt it would work like a traditional battery, by ions moving across a potential through a medium (water). My best guess is that the battery this article doesn't describe would work like a capacitor. Remember that pure water doesn't conduct electricity (at low voltages); in batteries, water's used as a medium for the movement of ions. If this is true, the capacitance of the 'battery/capacitor' would increase with freezing (allowing a greater charge to be stored) and decrease with the water turning to a gas. Another thought: phase states are a bulk material property. A single water molecule can't be considered a solid/liquid/gas. So, if the graphene sheets are too close to another to prevent the water molecules from forming their 3D crystalline structure... I really have no idea how that would affect the device. What bugs me is the tendency of recent articles to tout the virtues of new technology before an actual demonstrator is constructed,along with the paucity of detail offered.All we get are "will,might,could,should,etc". From the description,it does sound like some form of super-capacitor. Graphite gels are in play for long time. They're usually prepared with ultrasound dispersion of graphite inside of polar solvents (dimethylformamide) and or chemical reduction of graphite-oxide suspension. Supercapacitors based on nanotubes work better than graphite, because of fiber structure of electrode material. I don't see any potential for more effective energy storage there - it's just promo for fooling of investors. To d robison, BP is one oil company that I know of who is a major producer of solar panels. So you are correct, they know that change is inevitable and some, if not all are embracing that change by taking stakes in it whilst continuing to milk the oil cow for all they can get out of it. Is it the underlying article for this story? The silly PhysOrg news even don't allow me to find more details about the stuff - it's the brainwashing in its full glory. The Chinese are starting up the "CARBON AGE", in Australia we're banning and getting rid of it very cheaply, to China of course! That's science for you. Theory first. Then engineering. If you don't like it then don't try to read science(journalism)-articles. Lots of scientific groups specialize in doing simulations and then publish their data. Others may take it up and try it out (or not). The field (or basicaly an field) has grown too complex for one group to do everything from inception to simulation to development to testing to optimization to marketing. Ok! I will say it again!! What we need is to sticky this article so we can come back 2 years from now and see where it's at. Too many breakthroughs seem to slip through the cracks never to be seen again. @HeloMenelo; that's a good idea, to be able to link or relate articles together by users, rather than by doing a search for common keywords. Yes,I know,but doing an experiment(in this case,producing a proof of concept device) to validate a hypothesis is part of science too. You and I live in a different reality. When I was young, modern battery technology was lead-acid. It has progressed through various types of nickel technologies until now we have lithium ion batteries. I remember reading about lithium-ion when they were very new (and had a disturbing tendency to blow up spontaneously). So give the normal cycle of development some time before rejecting it. This article does not seem to state that the construct would be an electrolytic supercapacitor. To charge no chemical conversions take place, but can be done at a high rate, eg 1000's of amps. The important thing here will be the cost to build a storage device per kilowatt hour stored. Since it can be used thousands (probably many more times) the cost to build it can be higher. If it is cheap enough to build, it could store baseload electricity for use during periods of peak demand. That might be the next publication. It's just standard procedure to publish what you find every step of the way (heck, if it gets me a free plane ticket to go to conferences all over the world why wouldn't I publish my latest findings?). This is not about energy production, it is about energy storage. Hopefully, this will pan out. As described, it would make electric vehicles very competitive on all fronts. Can you imagine charging your car in the time it takes for fill the gas tank? That's one of the biggest problems with all electric vehicles now... not distance on a charge, but time to recharge. This is not about energy production, it is about energy storage. To everyone echoing the above sentiment, or saying an energy company doesn't care about this stuff, you're not thinking things through. Depending on how the whole carbon-to-renewables thing pans out, the two fields (generation and storage) will very likely become hand-in-hand concerns for the utility giants. As the power companies transition to more and more renewables they are most definitely going to have to figure out better storage to optimize their operations. Perhaps not via graphene (who knows it's potential? ), but whether it's super capacitors or whatever, energy storage is going to be synonymous with generation to a utility company as renewables grow. yet another physorg masturbatory pipedream. OMG GRAPHITE IS GONNA SAVE MY BABY! I wonder if there is some sort of... forgive me for inventing a term, Neutron Repulsion going on in these batteries? Definitely something to think about. This isn't ... "troll baiting" ... is it? The discharge rate would depend on the load,so an electric motor running a car at a steady speed would present a high impedance (equivalent to higher resistance) to current flow compared with the same car under heavy acceleration,which would be seen by the power source as a low impedance (equivalent to low resistance),which would drain the energy storage device/capacitor/battery at a faster clip. That is one of the beauties of electronics science. One can construct 'gated' control systems that allow less outflow of current than inflow, with assistance of voltage regulation and the additional supply of energy from regenerative breaking to help lessen the speed of discharge. Additionally, the capacitance can also be set up as an energy buffer between batteries and components. There already is a car with battery technology that will be able to be recharged in ten minutes at 220VAC. (At least, that is the claim). That is the Shelby Aero EV. Too bad the car is going to be priced somewhere between 500,000 and 650,000 dollars US. I'd have pre-ordered one but I cannot see paying more for a car than for a house. Perhaps a similar technology will actually be adopted with other designs that will be cheaper.